TabView 3.4 has been released on the Mac App Store. 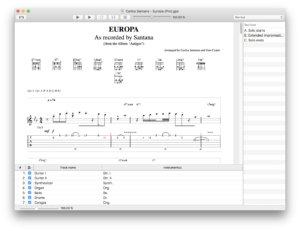 This version implements support for .gp tabs (GuitarPro 7). TabView 3.3 has been released on the Mac App Store. This version intoduces support for Mojave’s Dark Mode. TabView 3.2 has been released on the Mac App Store. This version improves the rendering of note stems in the standard notation. TabView 3.1 is now available on the Mac App Store. This is a minor maintenance update. TabView 3.0 is being published on the Mac App Store. TabView can read .gp3, .gp4, .gp5 and .gpx files too! This release also contains several other improvements and fixes here and there.